In a move to consolidate state power, and 14 months after he was sworn in for his final term, President Uhuru Kenyatta has made a surprise re-organisation of the government and put Interior Cabinet Secretary Fred Matiang'i at the heart of government operations, in effect whittling down the influence of Deputy President William Ruto. Through an Executive Order, President Kenyatta named Dr Matiang'i chairman of the National Development Implementation and Communication Cabinet Committee. In this new position, Dr Matiang'i will now be chairing meetings that bring together all Cabinet secretaries, Attorney-General Kihara Kariuki, and Head of Civil Service Joseph Kinyua. Missing in this composition is Dr Ruto, who has no role in the powerful Cabinet committee that reports directly to the President. 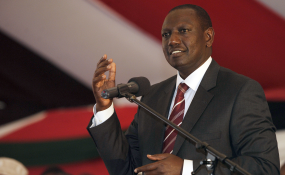 The Constitution places Dr Ruto, in his capacity as Deputy President, as the principal assistant to the President. Whether this move turns him into a lame-duck DP or will halt his presidential campaign machine, which has made considerable progress at the grassroots in the name of inspecting development projects, remains to be seen. But it appears that, by a stroke of genius, President Kenyatta has removed the "inspection" from his deputy and isolated him from having any leadership role in the management or administration of government projects. In May last year, President Kenyatta disparaged Dr Ruto's frequent grass roots meetings, describing them as "kutangatanga" (loitering). The tangatanga jibe was soon adopted by Dr Ruto's henchmen, who made it their campaign tag. A few days later, Dr Ruto told a public rally that was also attended by President Kenyatta that he is the supervisor of government projects and an emissary of the president. That role has now been taken from him and handed to Dr Matiang'i. In recent days, President Kenyatta and his deputy have been working at cross-purposes, especially on the 2022 succession politics. While the President has been urging the halting of early campaigns, the Deputy President and his supporters have interpreted the emergence of National Super Alliance (Nasa) leader Raila Odinga as an ally of President Kenyatta as a signal that the automatic handing over of the presidential baton to Dr Ruto come 2022 is a guessing-game. In Executive Order No 1 of 2018, issued on Monday, January 21, the President gave Dr Matiang'i the super role of providing "supervisory leadership throughout the delivery cycle of all national government programmes and projects". During the coalition government of President Mwai Kibaki and Prime Minister Raila Odinga, such supervisory roles were assigned to the prime minister, which means Dr Matiang'i will now be a de facto prime minister. During the reign of President Daniel arap Moi, both Jeremiah Kiereini and Simeon Nyachae enjoyed powers of the short-lived position of Chief-Secretary, which was abolished in November 1986. The Matiang'i team will also be receiving and deliberating on reports from another committee chaired by Dr Karanja Kibicho, another insider in the Uhuru wing of the Jubilee administration. Dr Kibicho will be chairing a technical committee that consists of 11 principal secretaries, and which will also co-opt Solicitor-General Kennedy Ogeto and head of Presidential Delivery Unit Nzioka Waita. Also, while the Constitution of 2010 appeared to curtail the powers of provincial administrators, President Kenyatta has now given the Regional Commissioners -- as they are known -- duties of coordinating the implementation of national government programmes and projects, which means such projects will no longer be supervised by the Cabinet Secretaries or Principal Secretaries in the line ministries. That single move will now allow the President to receive more intelligence on all government projects countrywide efficiently as he will only be relying on Dr Matiang'i to brief him. The Regional Commissioners will also be tasked with monitoring and verifying the projects and identifying bottlenecks, and will get their briefings from County Commissioners, who will be preparing bi-weekly reports on the progress of projects. Since devolution, the Regional and County commissioners have been at loggerheads with Governors, who feel that the civil servants should be junior to them. By making the regional coordinators, county commissioners and police commanders his marksmen in the counties, it appears President Kenyatta has effectively re-organised State machinery through these positions by giving them a new mandate, albeit with some political touch. "I want you to be fighters for Kenya and Kenyans," said President Kenyatta. "Allow no one to intimidate or distract you from your real job. You have my full support and that of my entire administration." President Kenyatta said the move is aimed at increasing efficiency and delivery of public projects, better utilisation of funds, reduction of wastage of resources, and gatekeeping. Wastage of public resources and high-level corruption were the hallmark of President Kenyatta's first term, and his determination to crack down on corruption has in recent days been left to a small team led by Dr Matiang'i, Director of Criminal Investigations George Kinoti, Director of Public Prosecutions Noordin Haji, and Attorney-General Kihara Kariuki. Others in this circle include Dr Karanja Kibicho and chairperson of the multi-agency team Wanyama Musiambo. President Kenyatta also said that the regional and county bosses will lead the fight against corruption, and asked them to exhibit "courage, integrity and resourcefulness to fight it". "The fight against corruption is won or lost daily on the ground, and I expect you to help deal with it. You are my eyes and ears on the ground. I expect you to communicate the essence of the Big Four Agenda, to report emerging implementation constraints, and highlight important gains at the grassroots," he said. The President also said government officials who have in the past been in charge of security committees will have a critical role to play in ensuring effective implementation of his Big Four Agenda. His move comes at a time when he has been placing former military bosses in charge of various crucial agencies as his critics accuse him of militarising government. Additional reporting by Mohammed Ahmed.